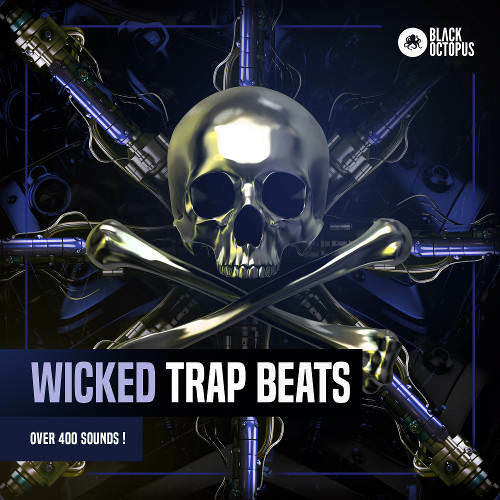 Black Octopus continues its wicked drum series with another hard hitting release, Wicked Trap Beats! Featuring a wide arsenal of bass heavy drum samples & beats, this pack is destined to make some club systems rattle. Build your own beats using the one shots in this pack, as a huge focus has been spent on the 300+ included drum hits. The snares & claps have all have that special iconic trap flavor, including pitched, organic claps, & 808 style snares. The crisp hihats work perfectly for those patterns featuring quick 16th note rolls. Pick one of the tight high kicks and layer in a fat 808 style sub for a nice full spectrum beat. In addition to the single hits, a good selection of toploops, drum loops, and build up loops have also been included so producers can get up and running with some fresh inspiration in no time. While this pack is labelled as a trap drums pack, there is also a lot of room for it to be used in other genres such as future bass, hip hop, and chillout.